First, thanks to everyone who hosted or joined me on my recent blog tour. It was a whirlwind, but great fun. Still, I am glad to get back to my own blog! In September, Scott and I attended Green County Cheese Days in Monroe, WI. 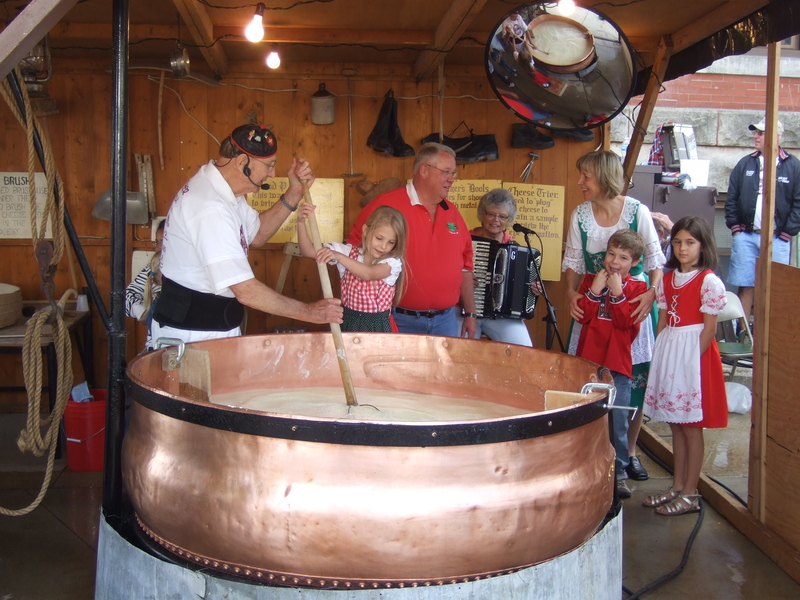 This community festival honors the early European settlers—many of them Swiss—who settled here. 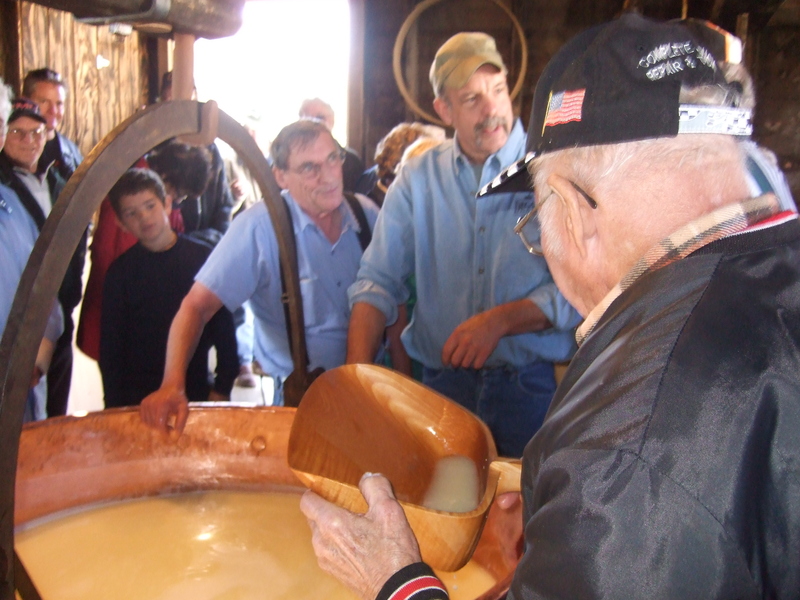 Several retired cheesemakers demonstrated the art of making cheese. This sign says it all. The cheesemaking demonstration was well attended. Young cheesemakers giving the process a try. 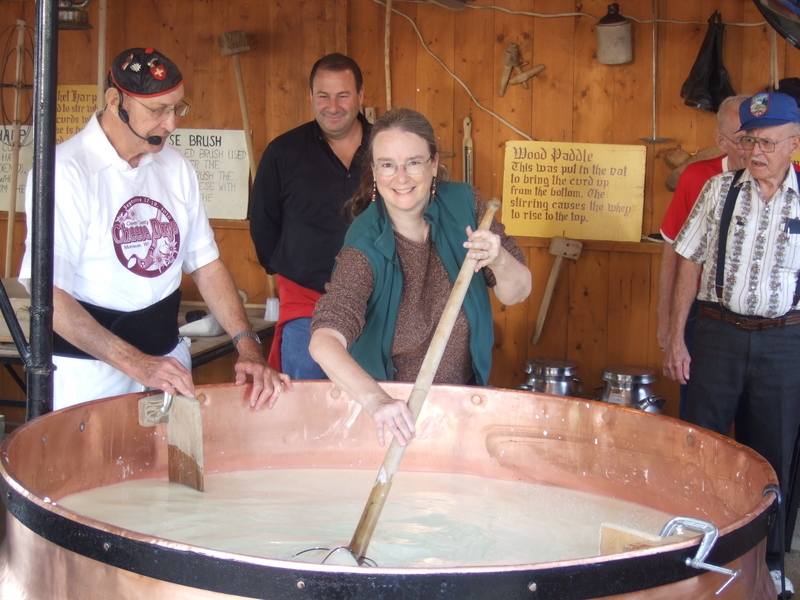 And I got to try my hand at stirring the curds, too! I took lots of notes, but my favorite thing about attending Cheese Days was watching the intergenerational sharing that took place in the spirit of honoring, preserving, and passing along tradition. In October, I had another chance to learn about traditional cheesemaking when the National Historic Cheesemaking Center in Monroe celebrated the grand opening of the restored Imobersteg Framstead Cheese Factory. (See my August 29 post for more information about the factory.) For the first time in over a century, a fresh batch of cheese was made in the old building. 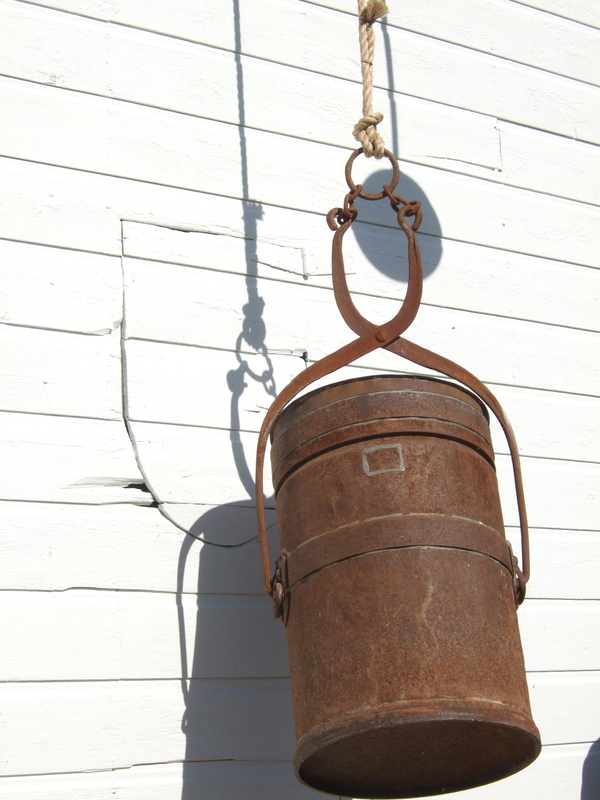 Historically, several local farms often banded together to process milk into cheese. Men brought their milk to the nearest factory in pails, and it was passed into the building through a trap door. 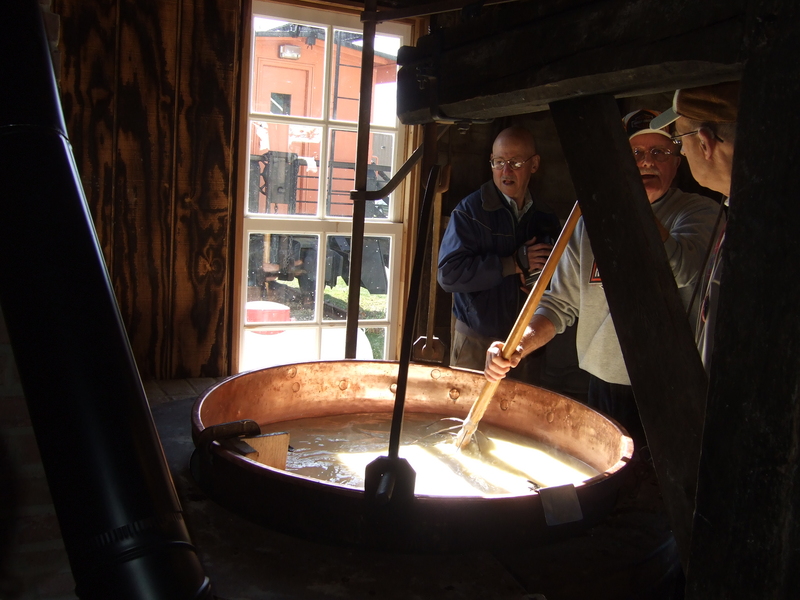 Several cheesemakers helped process the milk into curds and whey. Current and retired cheesemakers cooperated to get the job done. 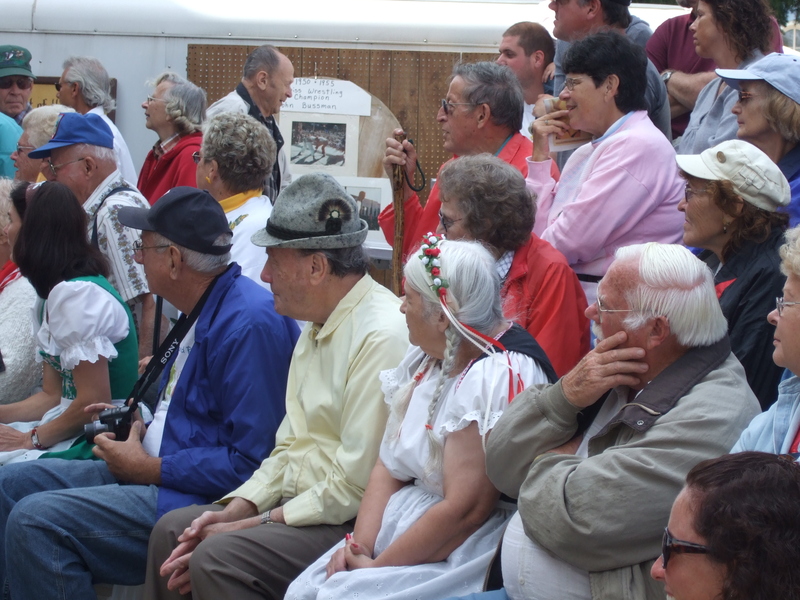 The demonstration at the Imobersteg Cheese Factory had a different feel than that at the Cheese Days Festival. I wished for a moment that someone had been assigned to interpret the process for visitors. Then I looked around and realized that the tiny factory was crowded with retired cheesemakers, and farmers who had taken their milk to a neighbor’s farm for processing. These people needed no explanations. I heard elders reminisce about the time, decades ago, when they too had made cheese in a tiny “cheese hut” on their property. One man told me how a neighbor sometimes brought bad milk, spoiling an entire batch. Another talked of numbering the milk cans to be sure the right ones got returned to the proper farm. When the curds had been taken from the kettle, one gentleman stepped up and helped himself to a drink of whey. Several more did the same, as they had doubtless done many times over the years. Around here, quite a few artisanal cheesemakers still buy local milk and carefully process it into fine cheese. As a consumer, I’m grateful for that. I’m grateful that people like me can watch and learn about this important aspect of the region’s cultural legacy at Cheese Days. 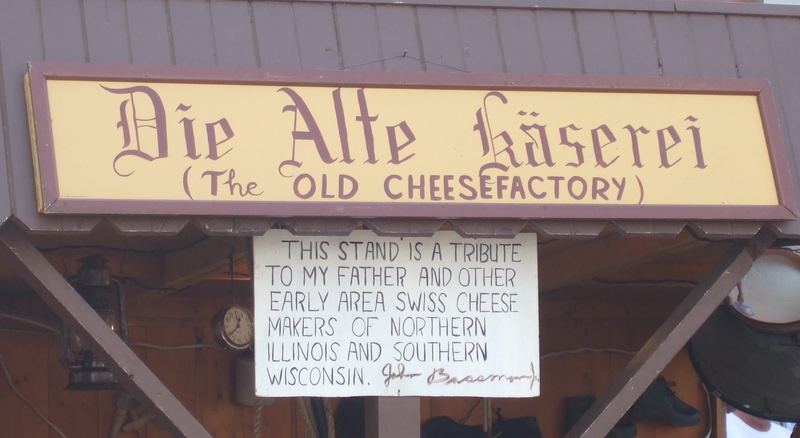 And I’m grateful that those who remember when had the chance to revisit the process at the Imobersteg Cheese Factory. All too often, old traditions and processes are rescued only when at the point of extinction. Not so here.